You know what a desire line is. You see them all the time. They’re those dirt paths that make a little crescent to cut off a corner, or a thin but distinct line that makes a diagonal slice through a grassy field, connecting two corners of a rectangular paved path. A desire line (or path) is a route that is the most direct way of going from one place to another, regardless of the existing infrastructure. That’s the dictionary definition, but I’m pretty sure I’ve seen desire paths carve out lines that aren’t functional at all, but ones that are meant for a leisurely stroll, I mean, as long as enough people desire the scenic route rather than the most efficient one. Either way, desire lines are people taking urban planning into their own hands. These things are absolutely everywhere in Toronto (and everywhere in everywhere), but recently I noticed them in a place that is a hive of crisscrossed paths, many of which have been paved over time to accommodate all these various desires. 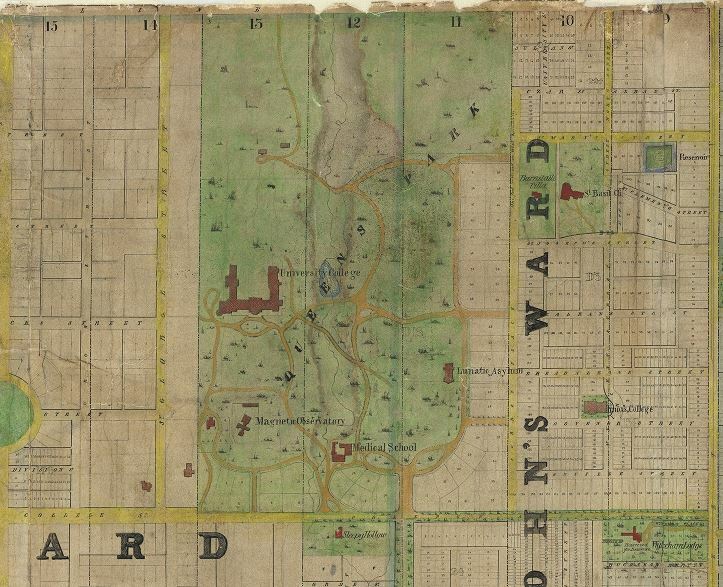 Queen’s Park used to be land that was owned by the University of Toronto. 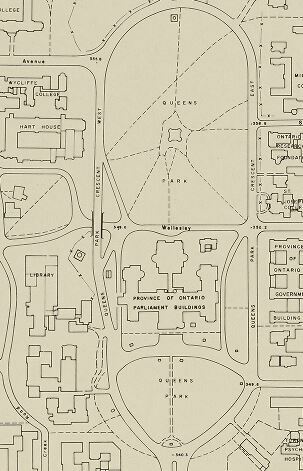 It used to be called College Park (and later University Park) and was the sprawling, green university grounds that was bordered approximately by modern day St. George St. to the West, Bloor St to the North, Queen’s Park Crescent to the East, and College Street to the South. 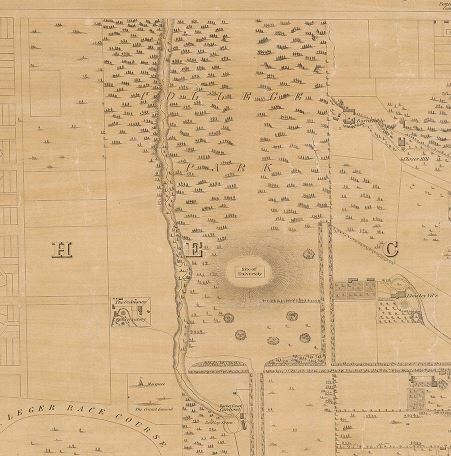 Queen’s Park in 1842*, though it’s called College Park here. Also, I hope you’re ready for lots of maps. Now, calling it a park in the 1800s doesn’t really make sense, as its surroundings were almost just as rural as it was, but soon the street grid of the rapidly expanding metropolis got built up towards it, and soon around and in it. 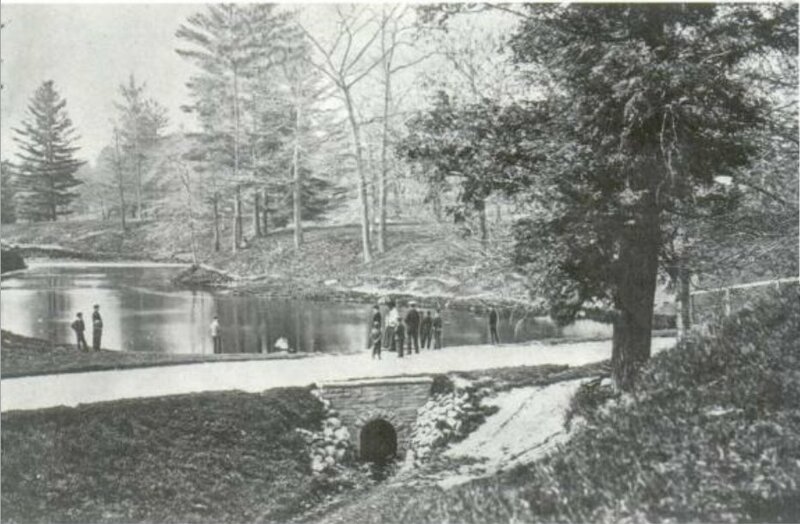 The pond at the end of Taddle Creek in the late 1800s. This picture is facing Northeast-ish. 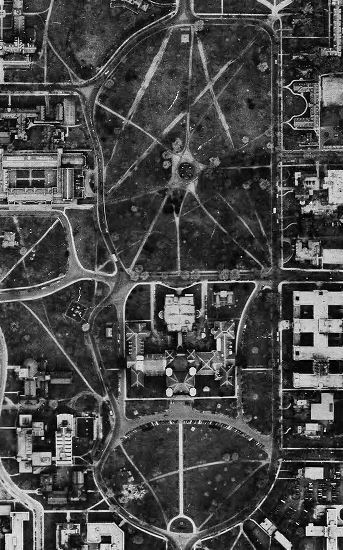 For modern reference for the above map, the street coming up from the south and making a ‘T” with the park is the one that became University Avenue. The creek running south through the park (called Taddle creek) loosely follows what is now philosopher’s walk and meanders south through the modern day U of T campus. 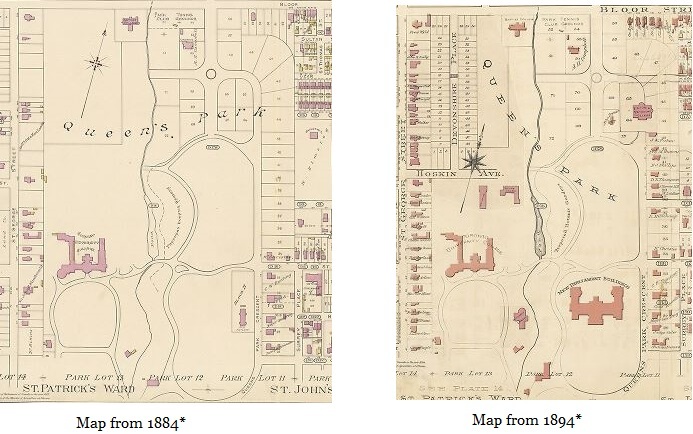 Note the new parliament buildings (as of 1892), and Hoskin Avenue being built to meet up with Queen’s Park circle. The creek was still going strong here (though it got turned mostly into a sewer in the early 20th century) and that dotted line following the creek was actually a fence separating the University College area with the newly provincial land. Now let’s jump ahead a bit to get to my heart’s true desire….lines. Below is an aerial photograph taken in 1947 and a city planning document from the late 1950s. Aerial from 1947*. Queen’s Park? More like…spiderman’s…park! Document from the late 1950s. Queen’s park? More like…well…actually, definitely Queen’s Park. Isn’t this cool? There are almost double the lines criss-crossing across Her Majesty’s park in reality than in the official document. Now, this is not a comprehensive urban design map for the park, and I also realize that as an urban planner you may be well aware of desire lines but not build them into the infrastructure. 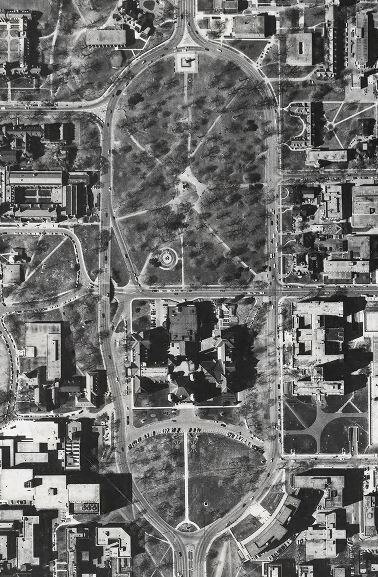 Also, having no aerial photographs before 1947 makes it difficult to see how many of those paths developed organically and how many were actually planned and paved at an earlier time anyway. AND this map on the right was at least ten years later. BUT all that being said, if these pictures are even the slightest indication, when you have 5 roads and at least 5 more pedestrian paths that enter the sides of a park, a planned, finite set of paths will almost never cut it. Actually, by the looks of the map on the left, it might be easier to just make the whole park into one giant path. What’s awesome about this is that the plan looks like it stays intact for a while, but as the city changes and grows, it evolves to meet the desires of its citizens. Now desire paths, of course, are not Toronto-specific. They’re not even city specific. I love them, and I love this particular example of them, because they make it feel like a city is kind of an organic thing. Buildings, parks, people, buses, sewers, dogs, these things all make up a city as individual components, but when they interact with each other and alter each other just by virtue of how they most naturally exist, that’s a living breathing ecosystem right there. They could have paved over Queen’s Park in its entirety. They could have left the creek there and had a narrow strip of park running north/south. They could have filled the grass with flowers to make these cross-paths impossible. But their actual choices, plus people’s penchant to walk where they please, paths be damned, makes this an exciting story to be told. Or at least to tell. Mostly I just wanted to get you thinking about desire paths. Once I did, I started noticing them everywhere. I also may have been guilty of trying to artificially manufacture them by running back and forth on a narrow strip of grass for a long time. Stay tuned for a bonus Remembrance Day special next week on top of the usual weekly posting, and happy desire walking! *All these maps can be found here if you want better resolution, or to explore them in more detail. So if you desire to (artificially) create a desire path, and fulfill your desire (your desire superimposed on desire), is this a desire desire path? 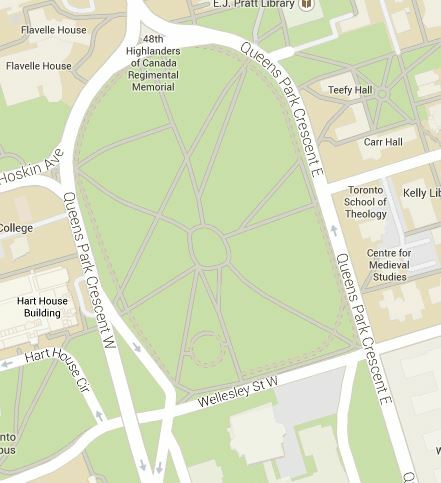 I create my own paths through Queen’s Park routinely, but not of them have yet turned into paths. Are they then just desires?